The teachers intentionally talk to children in a way that reinforces all the language, literacy, and math concepts necessary for school readiness. The difference at Paidea is that these concepts are taught in context of what the child is doing and thus have meaning. 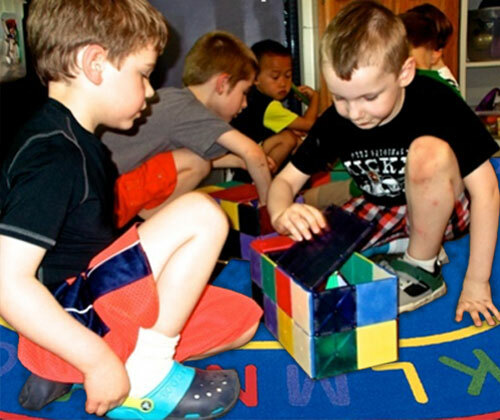 This is different than other curriculums where the children are taught these concepts, but it is in a teacher-led drill and practice worksheet method, which research has shown is not developmentally appropriate for preschool-age children. They can “learn it” but it is more rote learning than genuine understanding. Focus and attention – to pay attention without being distracted, to be able to stick to one activity. Persistence – to keep trying even if it is difficult. Sharing – to collaborate with others – teamwork. Problem solving – to think of several ways to reach a goal. Controlling impulses – to stop and think before acting. Delaying gratification – to be able to wait. Expressing feelings and needs with words – this is called self-regulation and is a necessary skill in school, work, and relationships. Research has shown these are the skills that matter most in school readiness and in life. Even if children know content, but can’t focus or attend to complete a test; or don’t persist if the task is difficult; or can’t problem solve if they don’t know strategies, they don’t perform well. Toddlers, who generally say “Mine” and want what everyone else has, are taught to say “I’m not done” and “When I’m done you can have a turn” (sharing). Children are encouraged to keep trying to get that puzzle piece in “You can do it; try turning it” (persistence). Most importantly, parents who attend our parent night programs are taught these same skills so they can implement them at home. This is what creates true partnership between home and school, and provides parents the skills they need to help their child do their best. Worksheets, and drill and practice at any age, and especially for young children, does not create an enthusiasm toward learning. Creating excitement for learning and encouraging children to ask questions and wonder is important at Paidea.